Walter Benjamin’s life, just like his work appears to us in fragments: his correspondence, the testimonies of close friends, journals and lists, hand-written manuscripts with crossed out text, all serve to lend Benjamin the mystical aura of a man who lived for – and through – his work. Think of his seminal piece on the concept of aura and art in the age of reproduction, “The Work of Art in the Age of Mechanical Reproduction” (1936), or the colossal and never-completed excoriation of phantasmagoria, The Arcades Project, written from 1927 through 1940. In this comparable, at least in length, book by Howard Eiland and Michael W. Jennings, Walter Benjamin: A Critical Life, these fragments are sewn together into a more coherent whole that follows Benjamin’s life and work chronologically, connecting the development of core pieces of writing and concepts to the specific locations in which they were developed or written and the key people that influenced them. Eiland and Jennings are well equipped to do just that, given their extensive experience translating Benjamin’s work. Over the course of this biography, Benjamin’s most celebrated achievements as a cultural theorist of the nineteenth century appear at times less as the result of a clear philosophical trajectory and more as attempts to constantly reinvent himself in often new and unfamiliar intellectual environments. As Eiland and Jennings point out, this only intensifies as Benjamin is forced by the Nazis to leave Berlin in 1933, give up on his hope for an academic career and rely on increasingly meager and unreliable publishing opportunities. In the process, Benjamin’s early interest in the youth movement, Immanuel Kant’s philosophy and early German Romanticism gives way to an increased focus on the study of experience, phenomenology, the messianic and the arts: in particular poetry, theater and visual arts. This turn in foci also marks a key shift in Benjamin’s life, from aspiring academic to cultural critic. As Eiland and Jennings carefully describe in their third chapter, “The Concept of Criticism”, Benjamin’s move from the study of language to the study of things initially proceeds slowly, prompted by his “fateful” early work on Charles Baudelaire, his increased attraction to mysticism through the work of Franz von Baader and friendship with Gershom Scholem and his developing philosophy of language which saw perception as an intrinsic modality of language. Benjamin, however, never gives up on his initial engagements with language, Romanticism, history and justice, and rather builds on them to develop his theories of origin and dialectical image, as well as his unique understanding of “knowledge” as related to experience. Eiland and Jennings’s enlightening discussion of Benjamin’s especially piercing engagement with the concept of criticism serves to show the extent to which his early work on Romanticism continued to influence his later reflections on the role of the “work of art” in modernity. Going back to his book Ursprung des deutschen Trauerspiels [The Origin of German Tragic Drama] (1928) and Benjamin’s short essay on Fyodor Dostoevsky’s The Idiot (1869), Eiland and Jennings carefully trace the development of Benjamin’s conviction that “Every work of art … rests on an idea; it has an a priori ideal, a necessity in itself to exist […] and it is precisely this necessity, and nothing else, that criticism has to demonstrate.’’ By holding onto his earlier intellectual convictions, Benjamin tried to redefine himself as a critic of modernity not in a journalistic sense, reporting on modernity, but rather in a much more philosophical one: uncovering the remains on which modernity is actually built. While scouring letters between Benjamin and Scholem, the Adornos and a variety of family and friends, Eiland and Jennings detail at length Benjamin’s struggle to remain relevant in a constantly changing intellectual environment dictated by his continuous moving about and later exile. With dwindling publishing opportunities, Benjamin is portrayed as constantly networking, in search of new intellectual homes and inspiration, and ready to embark on new projects while fighting to sustain existing ones. What emerges is a picture of someone who is constantly juggling several projects at once, more than half of which never materialize. Given his intellectual stature, Benjamin’s body of work has always been surprisingly small. Eiland and Jennings explain why by showing the extent to which a sustained work rhythm was unmanageable while constantly being forced to move – resulting in a much-mourned separation from his beloved library, as well as while under increasing financial difficulty to a point where even paying for basic expenses such as food became problematic. 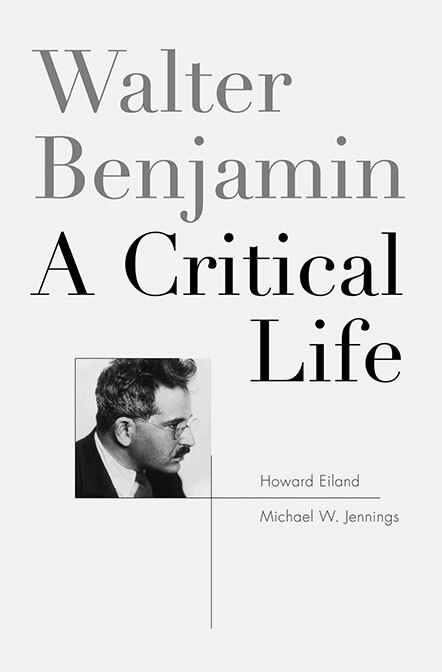 Like most biographers, Eiland and Jennings work with the assumption that uncovering key details of Benjamin’s life will shed new light on his work. Painstakingly researched, the volume reveals a personal life that is often far from exemplary. While Benjamin’s genius is never questioned by his friends, family and even intellectual rivals, his behavior and decisions leave much to be desired: dependent on his parents’ fortune for much of his life, and later on the charity of his (ex)wife and friends, Benjamin is described as feeling almost entitled to being taken care of by others. Hints of his addiction to gambling, his affairs and attraction to attached women, his constant frequenting of the demi-monde in Paris, his often cold, detached and at times outright dismissive treatment of friends, his abandonment of his child for much of his early life, and his inability to follow through on opportunities that could have potentially saved his life, all paint a rather grim personal portrait that does not match up to his otherwise admirable intellectual persona. In the end, it is unclear what we are to make of this double character or how, if at all, Benjamin’s negative traits may have affected his work. Eiland and Jennings try to pin his aloofness on his melancholic persona, that was after all key to his intellectual production. Like the angels on his walls, Benjamin seemed to exist in a separate realm, consumed by his thoughts and protected by a carefully guarded intellectual cocoon: even the people he treated worst, including his friend Scholem and his (ex)wife Dora, continue to support him throughout his life despite his shortcomings. Although seemingly aloof, Benjamin was very much aware of his genius and went to great lengths to document and preserve the little that he did write, leaving copies with friends, sending materials to be distributed and fighting to get his work published. While his determination to maintain his intellectual independence costs him a few publishing opportunities earlier in his career, towards the end, his complete dependence on the Institute for Social Research in Frankfurt leads him to make intellectual compromises that would probably have been unacceptable just a few years earlier. Eiland and Jennings question Benjamin’s friendship with Theodor Adorno and Max Horkheimer: Adorno, who starts of as a student admirer of Benjamin and relies on his work to build his own philosophy, fails at times, as Benjamin himself remarks, to properly attribute ideas to Benjamin, effectively appropriating them. Eiland and Jennings describe how Adorno’s later increasingly powerful position at the Institute for Social Research coupled with his desire to keep Benjamin away from his wife, Gretel Adorno, with whom Benjamin is rumored to have had an affair, results in an arms length relationship that seeks to encourage Benjamin’s grand project – The Arcades Project – while at the same time keeping Benjamin away from New York. Should we conclude that Adorno and Horkheimer effectively sign Benjamin’s death sentence by delaying sending him an entry visa for the US? That the misery of his last years could have been avoided through a slightly more generous stipend? Or quite the opposite, that the stipend was already generous enough given Benjamin’s slow progress on commissioned manuscripts and on the Arcades Project? There is no definitive answer provided, but the questions raised with regards to these two often duplicitous relationships – in spite of the widely known suspicions of Adorno’s recouping of Benjamin’s ideas on the allegorical – is enough to cast new light on two otherwise highly respected intellectuals. There is a lot more to take in from this new volume: the details of Benjamin’s life, travels, thoughts traced through his correspondence, intellectual exchanges, seminal books and authors he engaged with, art exhibitions he attended, affairs he had, although abundant, are not overwhelming. But despite its 768 pages, the volume reads almost like an addictive novel. Although we know the end, we still enjoy the ride. As for me, the volume sits on my shelf next to Benjamin’s Arcades Project, as an intellectual companion who has cared for Benjamin’s work with tenderness and respect, helping to carry on his legacy without tying him down to a specific intellectual agenda. Anca Pusca is a Senior Lecturer in International Studies at Goldsmiths, University of London and author of Walter Benjamin: Aesthetics of Change (2010). Her work uses a Benjaminian framework to understand social change in post-communist Europe, focusing on issues of popular culture, architecture and vulnerable communities. You can contact her at: a.pusca@gold.ac.uk.